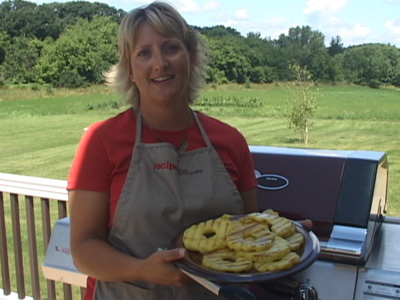 RecipeTips.com's video demonstration on how to grill fresh pineapple rings. For more information on pineapple and recipes visit RecipeTips.com. Today we are going to be demonstrating how to grill pineapple rings. We are going to be using this great Char-Broil infrared grill. Now I have already pre-basted the top side of these pineapple rings with a combination of butter, honey and lemon juice. You really do not need to put anything on your pineapple rings, it is all a matter of taste. So go ahead and preheat your grill, slide those pineapple rings on. Hear that sizzle? That means it is hot. You are going to cook these about 3 to 6 minutes per side. It all depends on the temperature of your grill. Go ahead and close the lid and cook for 3-6 minutes. In between that time we are going to baste them on the other side and flip them. Once you get the pineapple rings on the grill, go ahead and start basting the top sides of your pineapple rings. Then after about 3 minutes you are going to turn these over and grill the opposite side. OK it has been about 3 minutes so far, let us go ahead and check our rings. There you go, you have got the nice grill marks on each ring. Go ahead and flip those over and we are going to continue to grill those for another 3 to 6 minutes. Pretty. OK, these should be done by now. Go ahead and open up your grill and let us begin taking these off. Make sure they have a nice good color on them. They look great. OK, so these can be used in a variety of different ways. They would be perfect served up on a sandwich, you can serve them as a dessert, a lot of people like to plate them up, serve them warm with a scoop of their favorite vanilla ice cream, or enjoy them just like they are. For more great grilling recipes, visit RecipeTips.com.